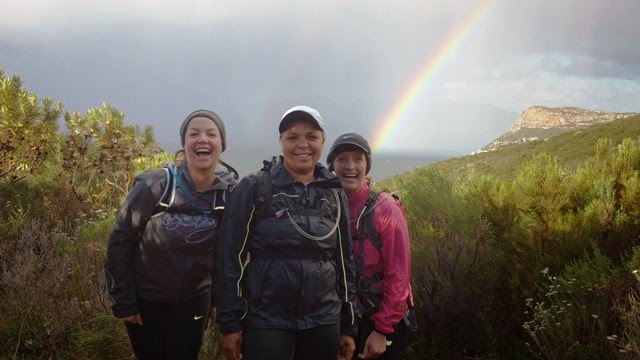 On Saturday, 13 runners braved the wet weather for a run on the face of Table Mountain. We met a the Kloof Nek car park, hoping that the rain in the suburbs would not be waiting for us here. Luckily, the rain held out for most of the run, but we did have to contend with the cold and the wind. What was thought to be the main bunch of 10 started out up through the trees and soon became 8 when 2 dropped back to join Randolf. From Kloof Corner Gregg set a really nice relaxed pace which allowed the small group of 8 to stay together. 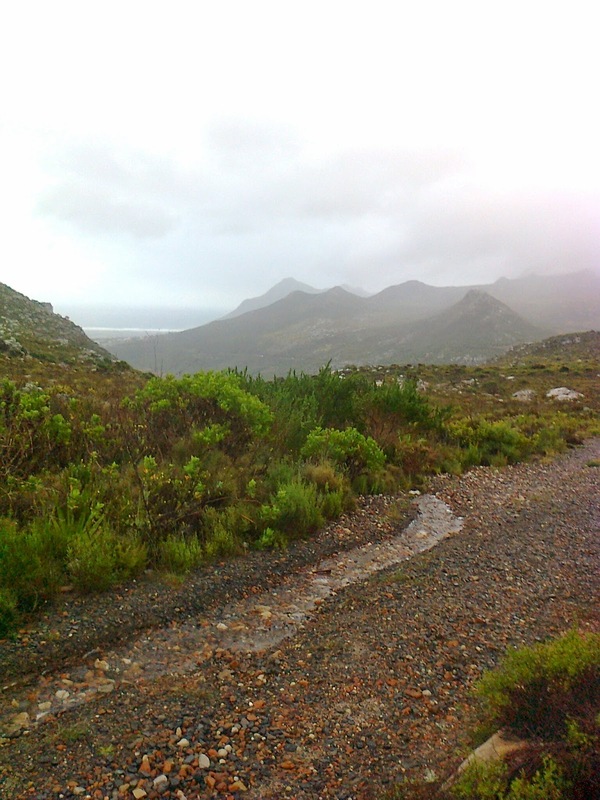 The contour path was (as usual) stunning with water running from every piece of the mountain and always great to run behind that one waterfall after the cableway. Lots of smiles and no complaining all the way up to the saddle where we found Tamsyn washing blood off her hand from a small fall, highly unusual for this lass. On the way to Oppelskop another stumble from another lass, luckily no blood, but definitely a bit shaken. Meeting of the Main and Recovery groups on the contour path. Then we were reminded that we were going very slow because one of us - Sam I think, had forgotten to record the rugby, after which followed an explanation that waking up a teenager to try to start the recording was just not worth the pain. We lost another runner to the tar road with other time constraints, so the remaining 7 of us hurried in a leisurely fashion back along the contour, down under the cable way and back to the cars where Sam dashed off to the TV and unbelievably it started to rain on us in the car park, the forecast was pretty good, well done to Accuweather. The recovery group did slightly different route than anticipated. 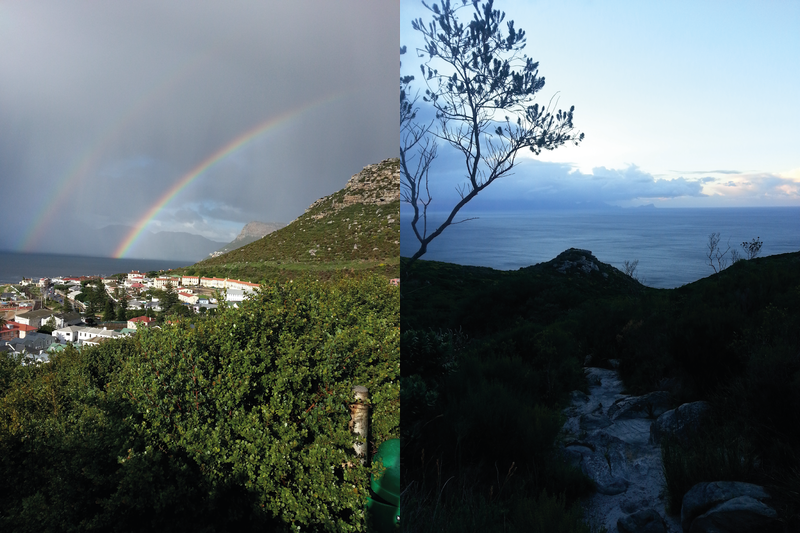 We continued along the contour path, passing the base of Platteklip Gorge and took the Groote Schuur path towards the King's Block House. 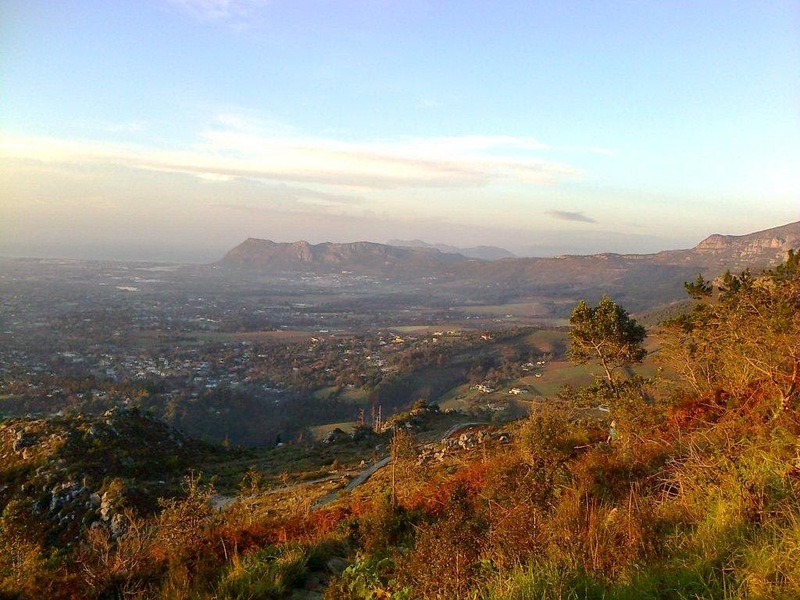 Before the Block House, we took a path to Tafelberg road, where we headed back towards the Lower cable way. We took the lower jeep track (also a mountain biking track) which pooped out at the car park. 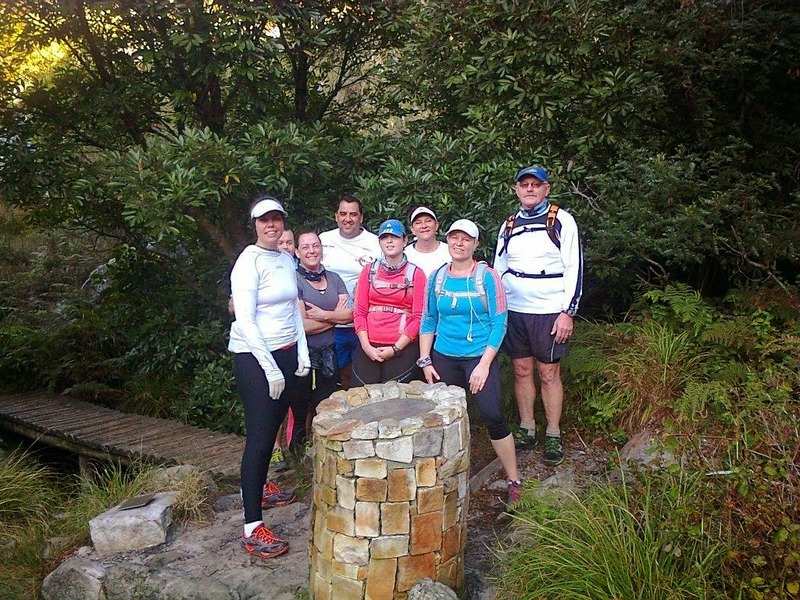 The recvoery group ran 14.6 km in 3 hours at a manageable pace led by Randolph. We were pleasantly surprised at how many people turned up to this run. The weather held for the duration of the run, only needing to put rain jackets on once, but the rain from the previous day meant that there were times we couldn't avoid puddles so did end up running in wet shoes. The route worked well, as we don't often start and finish on a downhill. 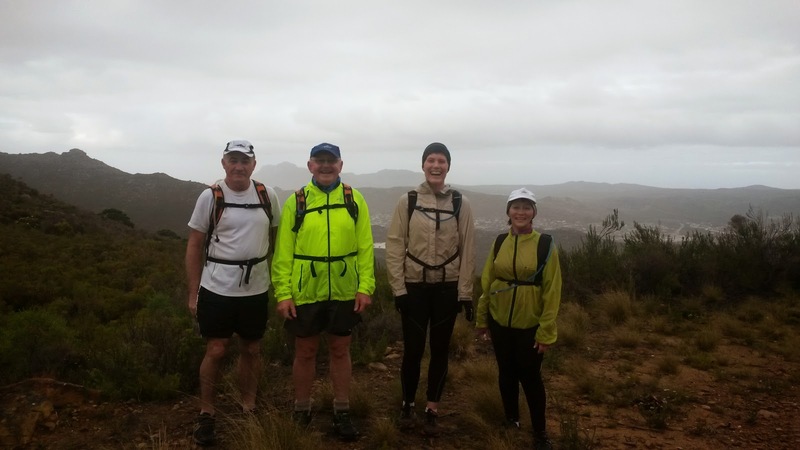 All groups started at Sunbird Centre, then a gradual zig-zag up the valley before reaching the nature reserve where we crossed Ou Kaapse Weg to the start of the Old Wagon Road. The the main group did two extra loops to give a distance of 14 km and the recovery ran 11 km. 18 runners turned out on what ended up as a sunny and warm winter Saturday. The main and recovery groups set off from the Constantia Nek parking lot to the reservoirs. 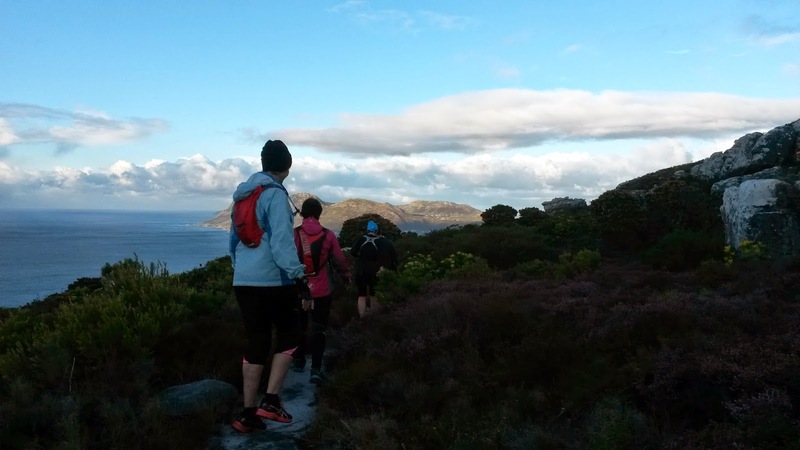 The run started with a climb to the ‘Bailiff cottage’ along the short cuts and jeep track. After the Bailiff cottage, the route turned right onto the Smuts track that lead to the top of Skeleton gorge, where it turned left to the Hely-Hutchinson reservoir and back to the jeep track. Here, the lead group headed around the Woodhead reservoir, while the recovery group followed headed back to the start along the jeep track and short cuts. The main group followed the same route down. View to the south from the top of the first short cut. The main group ran 13.2 km and the recovery group ran 11 km in the same time of just under 3 hours. The team's wishes go out to our runner who was injured in a fall and a special thank you to those who helped carry her to the car. 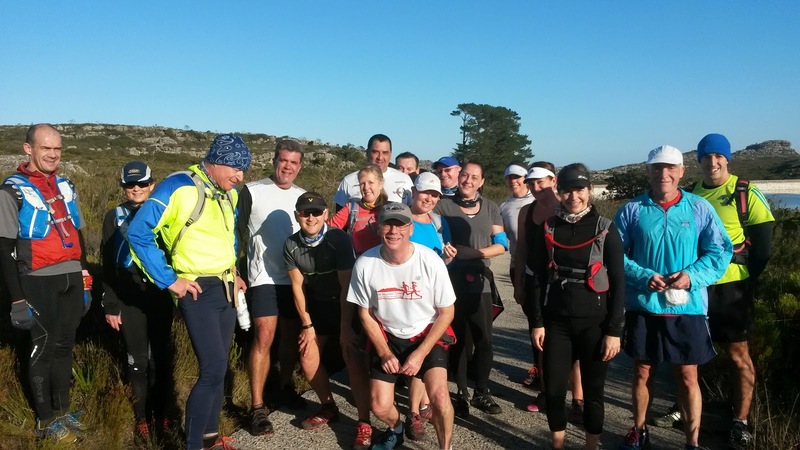 A total of 14 runners pitched up at Kalk Bay station on a very cold Saturday morning. The weather was crisp and cool, but otherwise really good for running with only the occasional smattering of rain (and some light hail on the top). 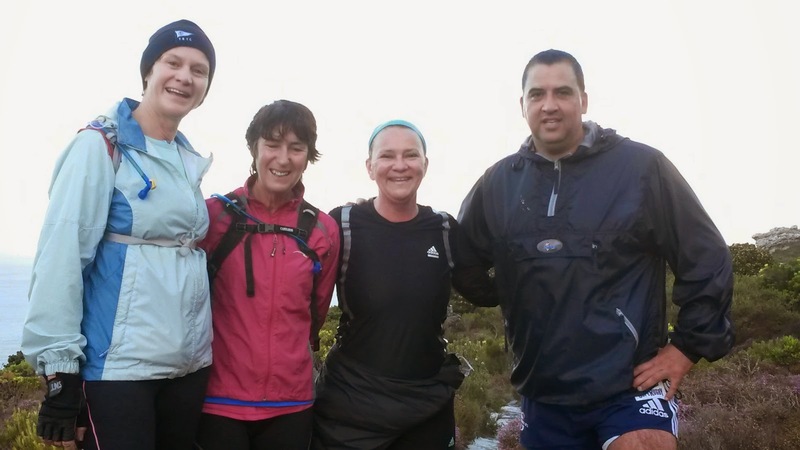 The main group led the way up the Oukraal path on the orther side of Boyes drive. The route carried on straight up Echo valley through a small strip of forest, and veering right towards the Amphitheater. At the Amphitheater, we turned left onto the Crassula path to the first jeep track. 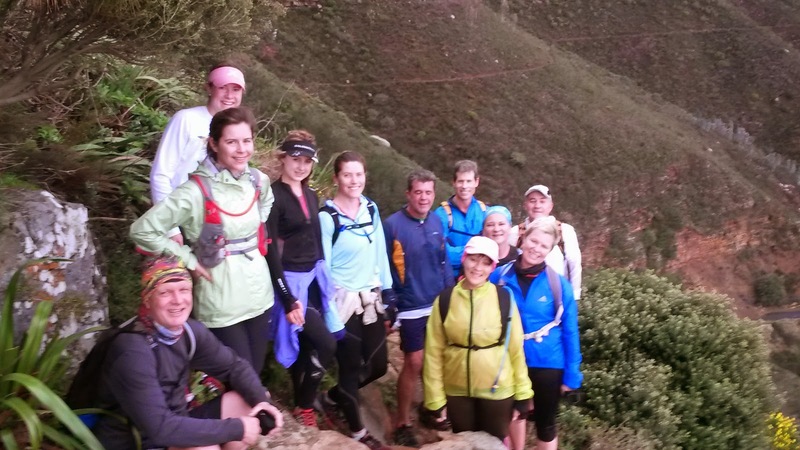 Here the recovery group turned right back up to Kalk Bay peak. The main group proceeded on the 'old Fisherman’s Path' to the next jeep track and on all the way to Junction Pool and Nellie’s Pool. 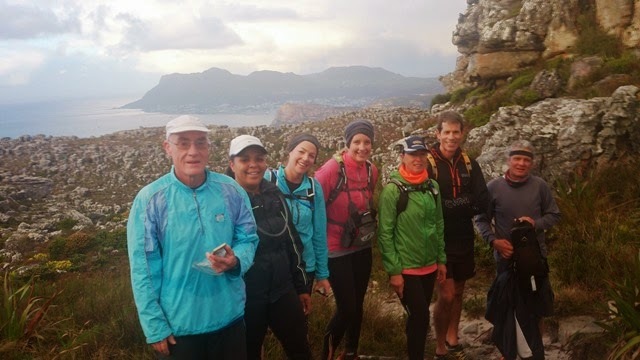 From there the main group followed the recovery group path up to Kalk Bay peak, past Tartarus cave and down into Spes Bona valley. All groups then turned-off at Weary Willy’s down through a bigger strip of forest. The recovery group covered 8.3 km in 2h 30 and the main group covered +/-11, coming in at 2h 45. Congratulations to Margaret who ran her 25th sortie, and both Dawn and Richard who ran their 50th sortie.